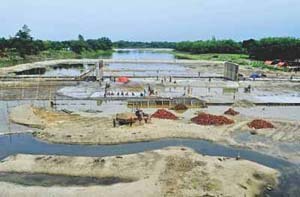 An inflatable rubber dam being built on the Atrai river in Dinajpur will be completed by the end of this year, facilitating irrigation using surface water instead of underground water as well as fish cultivation. The dam — 135-metre long and four-metre high– will create a 44- km long reservoir in the river that usually dries up in the lean season. Bodies of three teenagers were recovered from the Madhabkunda waterfall area in Barlekha upazila of Moulvibazar yesterday afternoon. A confident Victoria Sporting Club turned up for their league deciding last round match against Old DOHS with commemorative T-shirts. In the end, there was no potential banana skin as the favourites clinched their title with a two-wicket victory at the Fatullah Cricket Stadium yesterday. A grand finish was how Victoria Sporting Club clinched their fourth Dhaka Premier League title yesterday, overturning aspirants Old DOHS by two wickets. Title contenders Muktijoddha Sangsad joined leaders Abahani in the Grameenphone Bangladesh Premier League with a 2-0 win over Sheikh Russel KC in their crucial tie at the Bangabandhu National Stadium yesterday. The Great Wall of China has been officially declared even longer than previously thought. The wall measures 21,196.18km (13,170.6956 miles) long based on the latest state survey results, state-run news agency Xinhua reported on Tuesday. Former Bangladesh captain Sakib al Hasan has requested the Bangladesh Cricket Board to provide him with a break during the forthcoming Zimbabwe tour, said a senior BCB official on Wednesday. Hollywood superstar Brad Pitt has stepped in as a producer to help director Andrew Dominik on his long delayed Marilyn Monroe biopic. Naomi Watts was to play the iconic bombshell in Dominik’s biopic Blonde, which stalled before shooting was scheduled to begin in January 2011, reports Hindustan Times. Renowned lyricist Asif Iqbal is going to hit the country’s music industry again with his three latest albums. After a break of about two years, the talented artiste is coming soon with his coffers of lyrics to stimulate the listeners. Danish pop-soft rock band Michael Learns to Rock will perform in Dhaka on June 22 at the Bangabandhu International Conference Centre in their first ever visit to Bangladesh, said a press release. There is sudden surge of Bengali actors in Bollywood cinema after the box-office success of Vidya-Balan-starrer, “Kahaani” and Paoli Dam’s “Hate Story”.